Parenting stress has been linked with negative outcomes for parents and their infants (e.g., parental depression, negative parenting behaviors, poor attachment). Racial/ethnic minority adolescent mothers have increased risk for experiencing parenting stress compared to their White counterparts. Little is known about the changes in parenting stress over time for this population. Growth mixture modeling (GMM) was conducted to determine the growth trajectory classes of 185 African American and Latina/Hispanic adolescent mothers over 2 years. Risk and protective factors (e.g., maternal depression, social support, self-esteem) were examined to determine their influence on parenting stress trajectories. Three distinct trajectories of parenting stress were found: low stable stress (40.90%), decreasing stress (35.78%), and high stable stress (23.28%). Lower maternal depression (OR = 2.35), higher self-esteem (OR = 1.29), lower perceived social support from family (OR = 0.53) and higher perceived support from friends (OR = 1.65) predicted placement into the low stable parenting stress group over the high stable parenting stress group. Adolescents living with family (OR = 2.74) and Latina race/ethnicity (OR = 2.78) also served as predictors of placement into the low stable parenting stress group. Higher self-esteem (OR = 1.66) predicted placement into the decreasing parenting stress group over the high stable parenting stress group. These findings highlight the importance of perceived peer support by adolescent mothers, regardless of their support family support (e.g., living at home and receiving child care). Considering developmental factors such as peer relationships may be important when working with adolescent mothers. This publication was made possible by Grant Number APH PA 006041 from the U.S. Department of Health and Human Services to J.S.K. Support for Drs. Huang and Roberts was provided by a National Institute on Drug Abuse (NIDA) funded Postdoctoral Training Program (T32 DA019426 to Jacob Kraemer Tebes). The statements and opinions expressed are solely the responsibility of the authors and do not necessarily represent the official views of the Department of Health and Human Services or the National Institutes of Health. C.Y.H. : Designed the concept of the current study using secondary data analyses, conducted the data analyses, and wrote the paper. Y.H.R. : Collaborated with writing the paper. J.C.: Assisted with data collection, data entry, and data management of the study. J.S.K. : Designed and oversaw the implementation of the original study from which the current study’s data was pulled, collaborated in the writing of the paper. All procedures performed in studies involving human participants were in accordance with the ethical standards of the Yale University School of Medicine and with the 1964 Helsinki declaration and its later amendments or comparable ethical standards. Huang, C. Y., Costeines, J., Ayala, C., & Kaufman, J. S. (2013). Parenting stress, social support, and depression for ethnic minority adolescent mothers: Impact on child development. 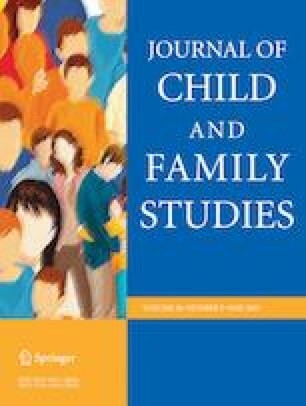 Journal of Child and Family Studies, 1–8. https://doi.org/10.1007/s10826-013-9834-y. Parra-Cardona, J., Holtrop, K., Córdova, Jr, D. A. V. I. D., Escobar‐Chew, A. R., Horsford, S., Tams, L., ... & Fitzgerald, H. E. (2009). “Queremos aprender”: Latino immigrants’ call to integrate cultural adaptationwith best practice knowledge in a parenting intervention. Family Process, 48(2), 211–231. https://doi.org/10.1111/j.1545-5300.2009.01278.x.